Andrew Stevovich makes paintings according to a worked-out method, to put it gently. That noted, they have their charm. His main influences are Piero and Seurat. I also detect input from Hashiguchi Goyo or someone similar, particularly in the blurred hairline on the woman in Loretta Feeding a Monkey (2017). Numerous small paintings, six to ten inches high, feature stridently geometric portraits. Their heads are practically eggs with coiffed hair and disengaged expressions on them, such as the smoker in Nadine with a Cigarette (2018). 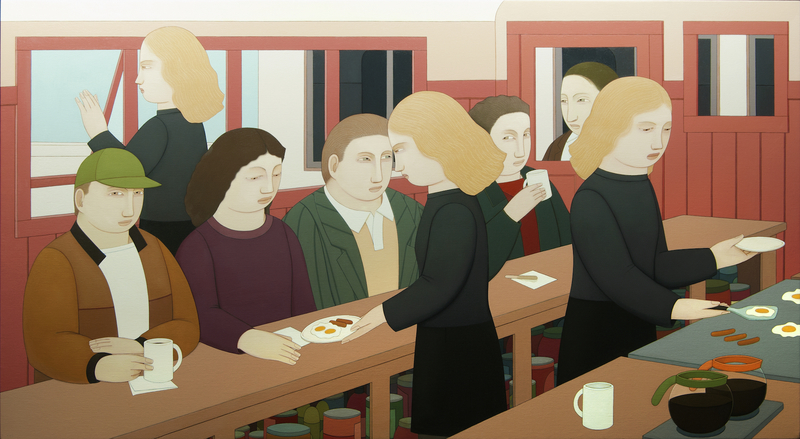 The point of the reductiveness becomes apparent in the larger, multi-figure compositions such as Jessie's Diner (2017), in which the people and interior architecture fit together like good cabinetry. Jessie, presumably, appears three times in a simultaneous narrative. It is orderly yet anxious in the manner of George Tooker, with some gravitas traded for humor. The stylization needs a bit of generosity from the viewer. Witty notes lurk throughout.